The Wax Museum of Legends leads visitors on an entertaining journey through the capital's history, to discover famous people associated with the city, as well as more recent international celebrities. Visitors meander through a serious of rooms, each depicting a scene from history where you meet the characters from that time. There is a historic street scene, an old Prague café, a magic laboratory, a sporting champions gallery, all recreated to display the waxwork figures in situ. And they are remarkably lifelike. In one, encounter Mozart aged 6 playing the piano for Empress Maria Theresa; in another, meet Franz Kafka out for a stroll; enter the royal court of Rudolf II and meet the greatest magical symbol of the time, Golem; and in a room at Prague Castle observe an act of defenestration, where Catholics are to be thrown from a window. Moving on to the 20th and 21st centuries, visitors can pose for photos with Brad Pitt, Marilyn Monroe, George Clooney, Michael Jackson, President Trump, and the latest addition, Queen Elizabeth II. A visit to the Wax Museum of Legends is a hands-on experience. Feel free to touch the figures, and use the props provided to dress up for selfies. You can even create a 3D model of yourself in the Discovery Workshop. The museum is child-friendly, particularly in the Kids' Corner where children can meet cartoon characters, and don an Indian headdress to pose for a picture with the Apache Chieftain, Winnetou. 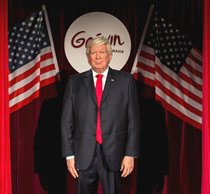 Prague is the latest waxworks museum from Grevin, joining their other outlets in Paris, Montreal and Seoul. It is suitable for adults and children of all ages. The intricate detail in the wax figures is extraordinary, and visitors will enjoy walking through the different rooms, discovering each new era and its characters, and interacting with them. Modern audio and lighting techniques enhance the experience.